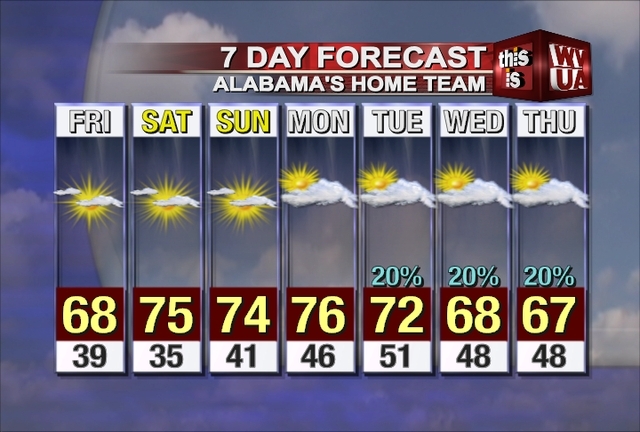 One more sunny day in store for West Alabama…then a good chance of rain returns to the forecast. Today, we will see a sunny start with clouds gradually increasing through the afternoon and evening hours. A developing low will bring a good chance of rain to our area Tuesday and Wednesday. Right now, it looks like the best rain chances will be Tuesday evening through Wednesday evening. We’re not expecting any strong/severe storms…just areas of heavy rain..and maybe a rumble of thunder or two. After a chance of rain early Thursday, we will see cooler/drier air rush in. This will be the coldest air of the season with afternoon highs only in the upper 50s and lows at night at or just above freezing. The weather will not be scary this Halloween weekend in West Alabama. Saturday night, it will be clear with chilly temperatures. Sunday, Halloween, it will be very warm in the afternoon and cool during the evening hours for trick-or-treaters. Monday, the first day of November looks nice, too. It will be mild with highs in the upper-70s. The middle of next week we have chances for some rain and thunderstorms. The threat for some rain stretches Tuesday through Thursday. After the rain moves out late next week, it will become much cooler! It’s still hurricane season in the Atlantic basin. Hurricane Tomas is churning in the eastern Carribean Sea. Its forecast track takes it westward through the warm waters of that sea and it could be a major hurricane by Wednesday or Thursday. You can track the tropics by clicking the Tropical Weather link on our main weather page at wvuatv.com. A Frost Advisory is in effect for West Alabama counties tonight from 1am until 9am Saturday. We’re expecting overnight lows in the 32 – 37 degree range from Haleyville down to Linden and all points in between. The weekend will be absolutely beautiful weather-wise. Plenty of sunshine Saturday and Sunday with highs in the lower 70’s. We do have weather changes in the forecast for Tuesday and Wednesday of next week, including a pretty good chance of rain. For high school football tonight we will see temperatures starting out in the lower 60’s…and falling quickly through the 50’s…then into the upper 40’s by the end of many ballgames. Chilly overnight temperatures will be the weather story over the next few days. 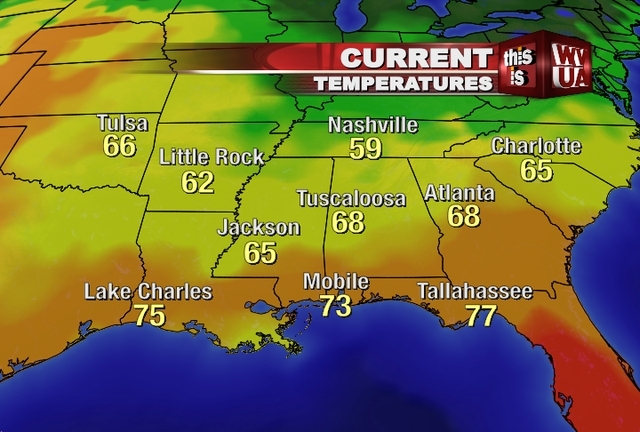 Friday morning look for temperatures around 38 – 42 degrees to start the day in West Alabama. Friday afternoon will be absolutely beautiful with plenty of sun and highs in the upper 60’s – lower 70’s. Friday night football in West Alabama will be quite chilly with temperatures falling into the 50’s during the game. By Saturday morning, look for a few areas of patchy frost and temperatures in the mid 30’s! Clear skies have moved into West Alabama this afternoon. Temperatures tonight will fall through the 60’s and 50’s by 10pm. Tomorrow morning look for temperatures in the upper 30’s. Plenty of sunshine for Friday with highs only in the upper 60’s to lower 70’s. By Saturday morning, we could see several areas of patchy frost in West Alabama. 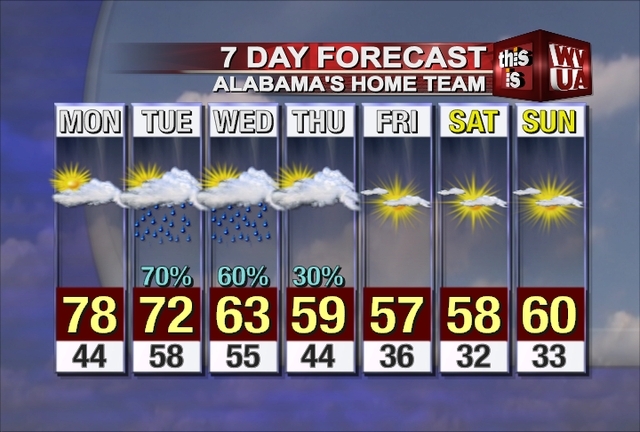 We will post the 7 day for you later this evening. SHOWERS AND THUNDERSTORMS ASSOCIATED WITH A SURFACE LOW PRESSURE AREA LOCATED ABOUT 600 MILES SOUTH-SOUTHEAST OF BERMUDA CONTINUE TO SHOW SIGNS OF ORGANIZATION…HOWEVER THIS SYSTEM DOES NOT YET HAVE A WELL-DEFINED CENTER OF CIRCULATION. ENVIRONMENTAL CONDITIONS ARE SOMEWHAT CONDUCIVE FOR THE DEVELOPMENT OF A TROPICAL OR SUBTROPICAL EPRESSION OVERNIGHT OR ON FRIDAY…HOWEVER UPPER-LEVEL WINDS ARE XPECTED TO BECOME LESS FAVORABLE AFTER THAT. THERE IS A HIGH CHANCE…60 PERCENT…OF THIS SYSTEM BECOMING A SUBTROPICAL OR ROPICAL CYCLONE DURING THE NEXT 48 HOURS AS IT MOVES EAST-NORTHWESTWARD NEAR 15 MPH. A good Thursday morning to you! Finally, the severe weather that seemed to never end has ended. After 2 days of tornado warnings and severe thunderstorm warnings, our weather has gone quiet. A refreshing fall airmass is taking over, and we’ll really notice a big difference in our weather tonight and tomorrow. Temperatures are expected to reach the upper 30s tonight, with clear skies. We may stay in the 60s all day on Friday, with a cool north breeze. The historic storm system in the north is weakening quickly and lifting into Canada. This was the one of the strongest storms in US history in terms of pressure. Aside of tropical systems, the pressure of this mid latitude cyclone was the lowest in the history of the US, at 955mb. In-fact, this was referred to as an extra tropical cyclone due to the fact that it had some tropical characteristics. Wind gusts in the 50s to 60s were a common experience in the northern US, with some gusts above 70 mph. This is the storm that is responsible in bringing us severe weather and tornadoes. It’s also what’s responsible for bringing us cooler weather today and tomorrow. High temperatures will gradually warm into the upper 70s by Sunday and Monday. We’ll continue sunny skies. A big cool down is possible by the middle of next week. The tropics have come to life, as tropical storm Shary could form later today. Also, two other areas of concern are in the Atlantic, as we continue a very active hurricane season. The good news is that all tropical features will stay well away from Alabama.